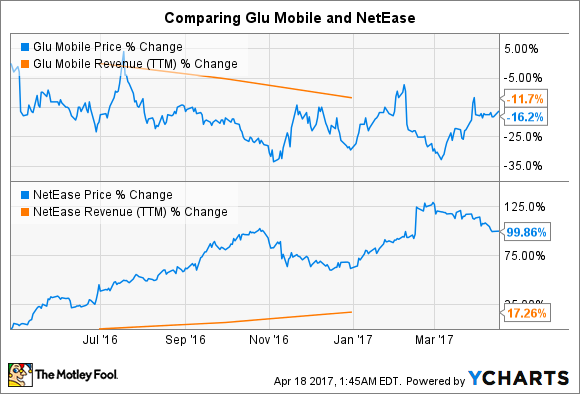 Glu Mobile has rallied this year after a weak 2016, while NetEase has maintained its momentum, but which is the better bet? Shares of Chinese online gaming giant NetEase (NASDAQ:NTES) have soared over 90% in the past year, thanks to a booming mobile-gaming business and the consistency of its PC gaming titles. Ironically, mobile-gaming specialist Glu Mobile (NASDAQ:GLUU) has failed to capitalize on the mobile-gaming craze, and its revenue has suffered. Not surprisingly, Glu Mobile shares have dropped in the past year, though they rallied last month despite the absence of any notable catalyst. Glu is trying to shift its business strategy away from one-time hits to longer-lasting games that generate recurring revenue, but does this make it a better bet over the more diversified NetEase? Glu has been trying to capitalize on social fads to drive its business with titles such as Kim Kardashian Hollywood and Gordon Ramsay Dash that made big money when launched but had weak staying power. For instance, the Kim Kardashian game was launched in June 2014 and pulled in $100 million in revenue in just 18 months before losing steam in 2016 with just $33 million in sales. Therefore, Glu is now trying to develop games that can generate a consistent revenue stream over a longer time period. CEO Nick Earl now wants the company's platform-centric games to bring in "repeatable, predictable revenue that stacks year over year." The good news for investors is that Glu has already started working on such games. Its Tap Sports Baseball franchise gained tremendous traction last year, and its bookings more than doubled to $27 million. The franchise could do better this year, now that Glu is licensing intellectual property from Major League Baseball, giving it access to exclusive features that provide better game play. NetEase's biggest advantage over Glu Mobile is that it can leverage the popularity of its existing PC games on the mobile platform. The strategy has reaped dividends for NetEase, which has been developing mobile versions of popular PC games such as Westward Journey Online. As it turns out, the Chinese video-gaming specialist has over 100 mobile games in its portfolio and is set to raise the bar this year with seven new self-developed mobile games. But Microsoft's Minecraft could be NetEase's biggest win this year, as the latter has a five-year license to operate the PC and mobile versions of this wildly popular game. As it turns out, 51% of Minecraft players in the Asia-Pacific region access the game on mobile, so the partnership should boost NetEase's mobile gaming business once it goes online in the second half of the year. More importantly, NetEase is looking beyond mobile gaming toward augmented reality (AR) and virtual reality to drive future sales. The company has already integrated AR capability into its popular role-playing game Onmyoji, which was downloaded over 10 million times in China within a month. Such feature additions should ensure a strong gamer base for NetEase titles. What's more, the company is now taking Onmyoji into international markets such as North America, Europe, and Japan that could open up new revenue streams. NetEase is already executing the model that Glu Mobile has just adopted. The former's long-standing expertise in PC games gives it an edge over the mobile-gaming specialist, but this is not where the differences end. Glu Mobile's cash hoard of $102 million pales in comparison with NetEase's cash position of $5.29 billion, giving the Chinese company a lot of financial muscle to market existing titles or develop new ones. NetEase also has an impressive profit margin of 30%, while Glu is deep in the red, making the latter a better bet since it has a proven and profitable business model.